The experts in chain specification. Studlink chain, the most popular, is used by the shipping and oil industries. Studless chain, which as the name suggets, has no studs and is generally used in special mooring applications such as permanent moorings for FPSOs. Typically, open link chain is used for marine moorings. Chain size is generally expressed as the diameter of the steel at the bending area. This can mean that steel bars of 78-79mm may be used to manufacture chain of 76mm diameter. Chain can be fitted with open end links to enable shackle connections to be made. These end links are normally forged to the chain using an intermediate link also known as an enlarged link. These links are larger than the diameter of the chain to take into account the differing radii and the reduced strength of the links due the end link being studless. Chain strengths are expressed as grades followed by a number. The letter used varies with countries but the strength of the chain remains the same. The United Kingdom uses “U”, France and Spain uses “Q” and the Scandinavian countries use “K”. The number relates to the type and ultimately the strength of the steel. U1 grade is mild steel, U2 high tensile steel and U3 special heat treated steel. These grades are normally only used within the shipping industry as the oil industry demands even greater strengths for the chain used. The original grade designed for the offshore industry was ORQ (Oil Rig Quality). Although this chain is still in use it has been superseded by new grades such as Rig Quality 3 and Rig Quality 4. These grades were introduced by the classification societies in order to standardise quality. The same grades also apply to the joining links that may be used with the chain. Tables showing the various strengths of chain are shown overleaf. 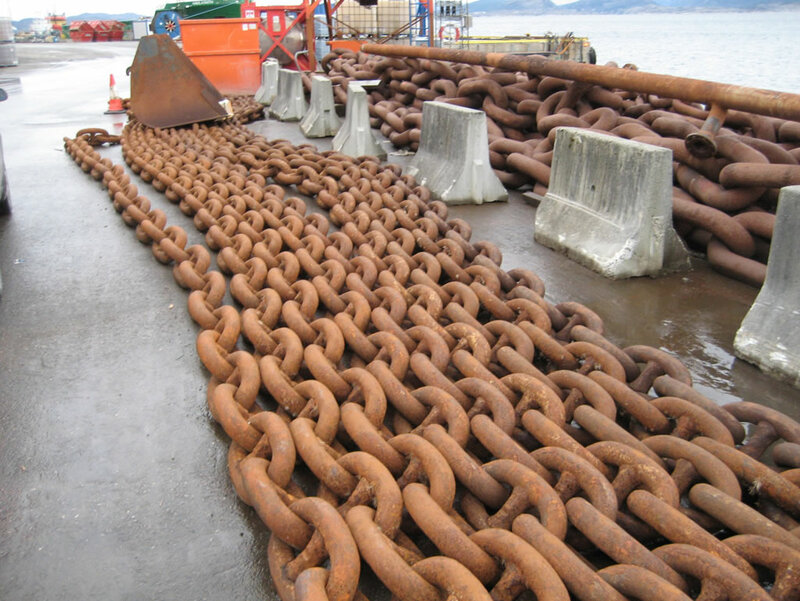 The offshore industry dictates that chain must be periodically inspected for wear and defects. The level of inspection and the intervals of these surveys are laid down by the classification authorities. Viking SeaTech can carry out such inspections to ensure you are in line with relevant classification safety requirements.